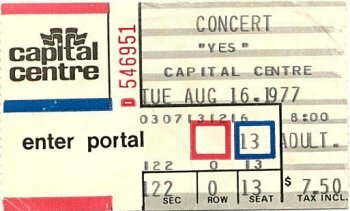 This was my first YES concert, it was outstanding but they did NOT perform YIND that night. The clerk at The Hecht Company window said "I don't have any seats left for Steve Miller, but, tickets for Yes just went on sale a couple of minutes ago". I stood there with enough money for five tickets from four of my friends who had probably never heard of Yes. "Sure, I'll take the best seats together you've got" I heard myself say. Third row from the stage, center section... ideal for what turned out to be the concert of a lifetime! It seemed like an errie start when we were driving to the show and the radio announcer said (about ten times) "The king of rock and roll is dead". From the opening all the way to the two song encore, we were mesmerized. I remember looking at my friends during Close to the Edge. They had that open-mouthed-staring-at-a-ghost look that I figured I had just snapped out of. It was (and still is for me) the show against which all others were measured. First YES concert and the night I became a full YES-freak for life. Elvis death seemed to further timestamp everything. I never found out if the dancing during TURN OF THE CENTURY was staged or not but it made the performance magical. Wakeman was wonderful on Awaken, which was the beginning of a modern classic. The white and black stripe suit by Chris Squire along with the triple neck bass was one on my favorite memories of YES then. This will always be the best YES lineup. I saw this show and I remember Donovan announcing that Elvis had died. The opening was amazing....firebird rising and someone on the floor, a fan, exhorting the crowd to get louder, louder. Turn of the century was a highlight of the evening, still one of my favorite songs from that period. The [DC] show was on the day that Elvis died and Donovan dedicated a song to him (I think it was "Rock and Roll Soldier"), while Yes did not even mention the passing of "The King".